When I was a kid growing up in Colorado, one of my favorite things to do in the late summer was to go berry picking with my godparents. My godmother’s family were Colorado pioneers, and she knew exactly where to go to find sweet, ripe, juicy berries, just as her family had done for nearly 100 years prior. I don’t know if it was the Jeep ride to the berry patch, the cool Rocky Mountain air, spending time laughing with loved ones, or the wonderful pies and cobblers that were hand-crafted for dinner upon our return home, but I loved these outings. A few years ago, one of my chef buddies got me interested in foraging here in Florida. Anyone that knows me can attest to the fact that I am a complete geek in more ways than one, and my passion for learning trivial facts about the world around me further reinforces this. I’ve been following Green Deane and his blog Eat The Weeds for a number of years and been fascinated about foraging locally ever since. Deane calls central Florida his home and regularly holds classes in the area. I was thrilled when I found out that on Saturday, September 10th he would be in Red Bug Slough here in Sarasota, so I signed up for his class. I knew that I wanted to write a blog about this class even before I went, but what I didn’t realize is that within the first five minutes of the class, I’d have enough to blog about for at least a half-dozen posts. The class was a very interesting mix of students. My impetus for taking the class was driven by my culinary background, and wanting to learn about food growing in the wild. Others in the class were botanists, herbalists and survivalist. I went into the class wanting to learn about food, but the class had a far greater impact on me. 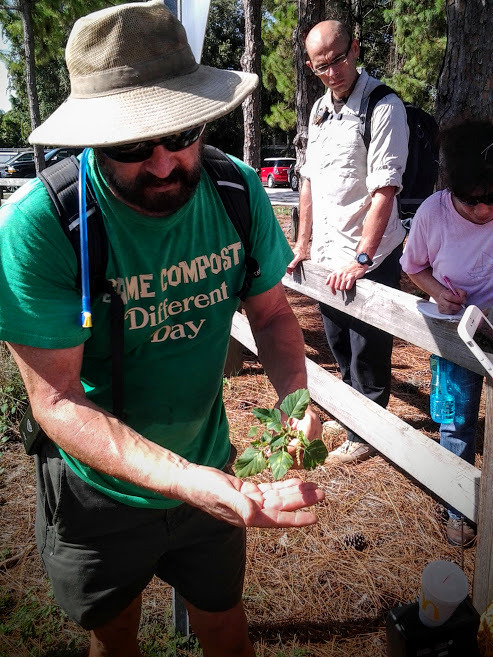 Not only did I learn about plants that I could eat to sustain myself, and how to prepare them, but Deane taught us how most of the plants growing have a medicinal value as well. The class lasted about 3 1/2 hours, and I took 6 pages of notes, covering well over 50 plants. Deane is one of the most interesting people I’ve ever had the pleasure of meeting. Latin genus, species, common names and uses for plants came pouring from his lips at a shotgun pace. He intertwined scientific lingo for the smart people in the bunch with humorous anecdotes for the guys like myself. 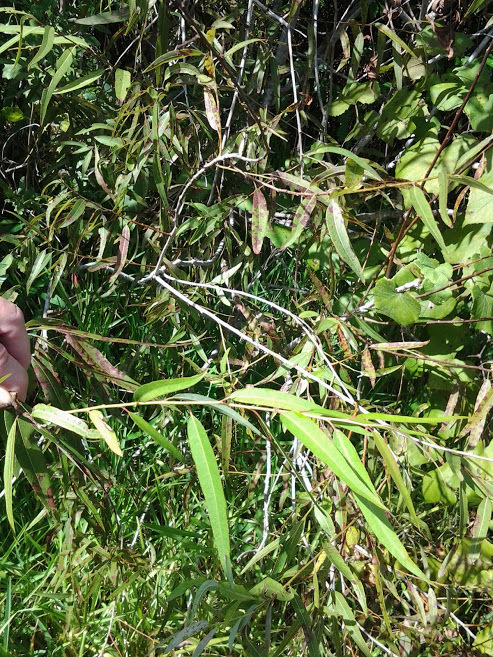 Carolina Willow is edible, but very bitter. In fact, during our class Deane had us taste it, and then asked what medicine it tasted like. I was immediately taken back to my childhood, when I would be sick, and Mom would have me swallow bitter Aspirin tablets. I was indeed correct. The salicin in the plant was what scientists used to replicate in the making of Aspirin. 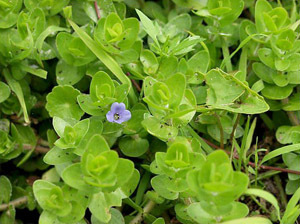 When the plant is eaten, the salicin mixes with stomach acid to form a compound called salicylic acid, which naturally reduces fever, aches and pains by depressing parts of the central nervous system. You can read more on Green Deane’s website. You’ll have to click on the image above to get a larger image, but once you see these distinctive yellow and white flowers, you’ll recognize the plant instantly. 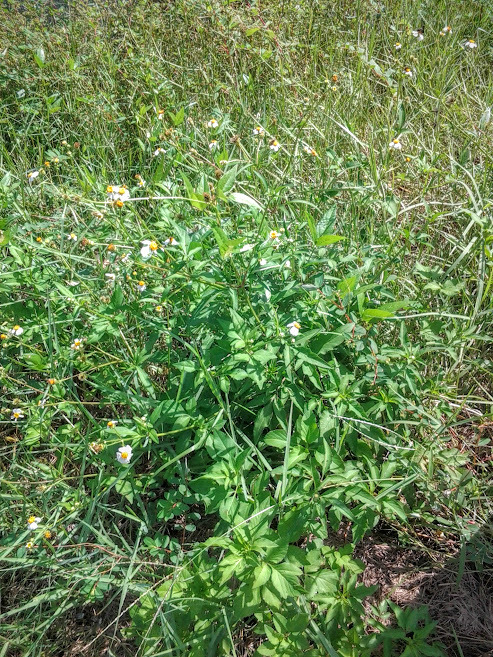 According to Deane, bidens alba plays a huge role in the production of honey in Florida. Leaves can be chewed to sooth sore throats. If the plant is dried, and a tea is made it can have dramatic effects on arthritic pain. One student in our class verified this claim with personal experience. You can read more about bidens alba on the Eat The Weeds website. This next plant I found of great interest, due to the amount of ways it can be used. 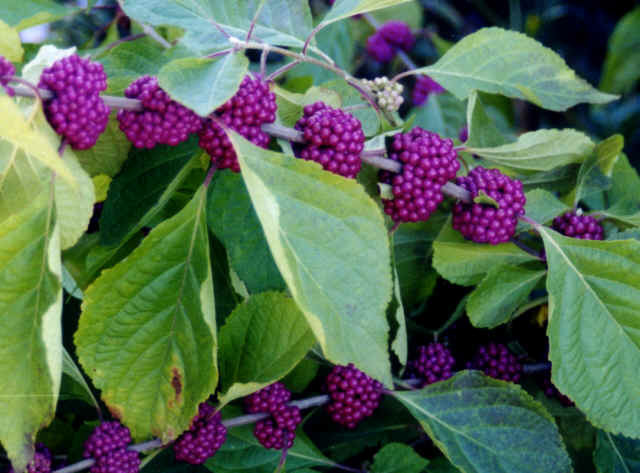 The berries are indeed beautiful, however the taste raw is a bit of a let-down, in spite of their colorful splendor. It isn’t that the taste is particularly unpleasant, there just isn’t much flavor. Although I have not played with this yet, I’m told that the berries make an excellent jam. What I found to be most helpful, especially here in Florida, is that the leaves, when rubbed on the skin make an excellent mosquito repellent. A great tip for any outdoor experience here in The Sunshine State! Indians made a tea from the roots and the berries and used it to cure colic in infants (I wished I would have known about this when my twins suffered from it 12 years ago!). You can read more on Green Deane’s website. My father suffered from and died from Alzheimer’s disease in 1998, and although my Mom was never diagnosed, she showed signs of the disease before her passing earlier this year. Needless to say, I am petrified of getting this disease. This plant may offer hope. Apparently, studies have shown that it works to “rewire” the DNA, and can actually reverse dementia. Rest assured, I will be doing a lot of additional research on this plant! You can read more on Green Deane’s website. The hairy cowpea is an African relative of the black-eyed pea. 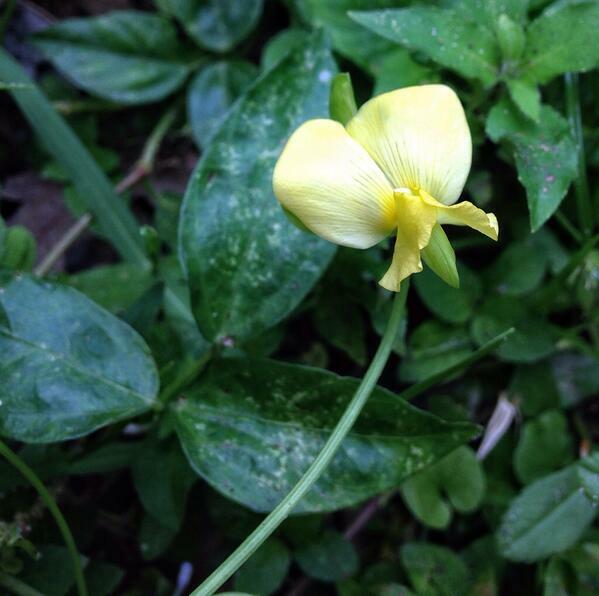 On our foraging expedition Saturday, I was impressed by the flavor of the yellow flower, reminiscent of fresh English peas. This would make a sumptuous and colorful addition to a Summer salad. The beans that the plant produces are edible when cooked, and I’ve read that the root produces a sweet juice when crushed. You can read more on Green Deane’s website. Looking at this plant, it’s not hard to tell why it was named crowfoot grass. I’ve seen this plant many times, and like many others on this adventure, never realized that it could be a food source. When the seeds are ripe, they can easily be pulled off the stem and eaten raw, or cooked like you would any other grain with seasoned stock or water. 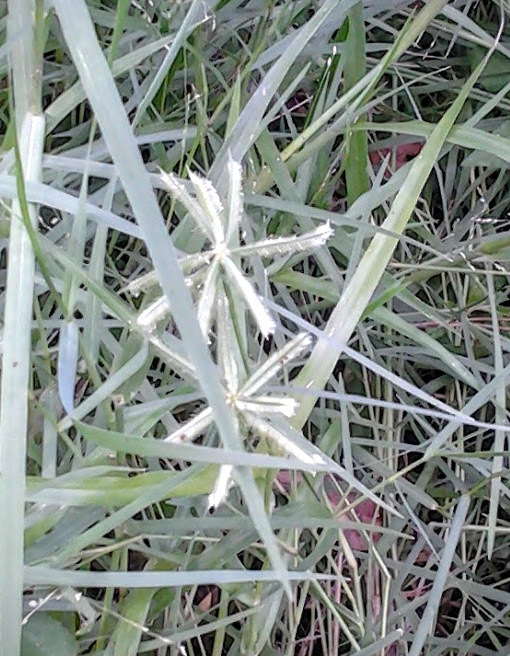 In Africa, this plant is a staple grain. Deane explained to us that in Africa, bread by the name of “Kisra” is commonly made with flour milled from this grain. Beer can also be fermented from the grain. You can read more on Green Deane’s website. Hopefully, this provides some insight into my adventure. If you found my writing the least bit interesting, you should take one of Green Deane’s classes. He is in our area fairly frequently. This is so cool! I homeschool (unschool) my younger 3 kids, and recently were curious about poke berries, and lots of caterpillars and bugs. This has inspired me to look into what’s in my area (GA). Very cool! Looking forward to learning about other overlooked food sources.